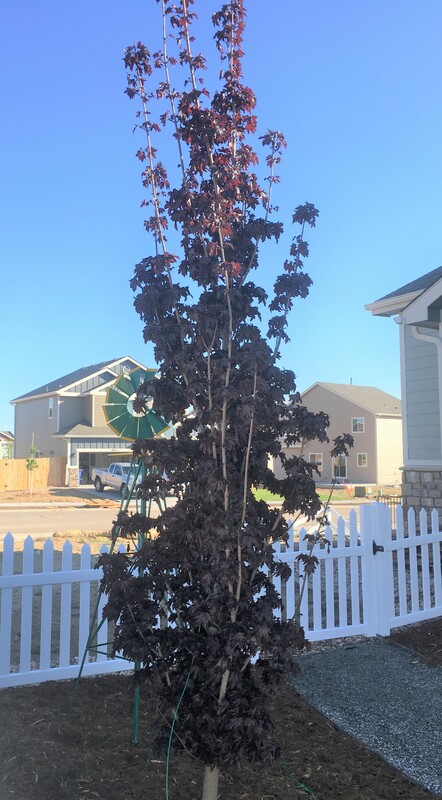 Crimson Sentry Norway Maple is the May 2017 plant of the month – Glacier View Landscape and Design, Inc.
Acer platanoides ‘Crimson Sentry’ came about as a stunted sport on a Crimson King Maple in Oregon in 1974 and was cultivated for its narrow columnar shape. Norway maples as a species can grow to 100’ tall by 40’ wide. The Crimson Sentry however, is a cultivar, like Acer platanoides ‘Columnare’, that maintains a columnar shape, growing a mere 12-15’ wide by 30-40’ tall. Desired extensively in Boulder Colorado landscapes, Crimson Sentry is hard to come by, with the yearly shipments to Colorado being snagged quickly. Their desirability is in the tight, narrow growth habit, the burgundy color throughout the year, and their relatively fast growth habit. ‘Columnare’ on the other hand, is green throughout the growing season. Native to Europe, Scandinavia, Eastern Russia and as far south as Northern Iran, the species in its native habitat could live to 250 years. The cultivar has only a few decades of testing, so its longevity is unknown. Requiring moderate moisture, it will not do well as a xeric tree in Colorado landscapes, but with a bit of added water, perhaps near a patch of irrigated lawn, it will thrive. Flowers are not showy, but do stand out a bit as yellow against the newly emerging green and burgundy leaves which quickly turn to all burgundy as they mature. The roots of any Norway Maple are close to the surface, and due to its dense growth habit with burgundy leaves, the Crimson Sentry and Crimson King will steal all the water and light from underlying grass. It is best to plant this species outside of the grass turf area. There is contentious debate as to whether the roots emit a toxin that inhibits the growth of other plant species under the canopy of the Norway Maple. It has not been proven either way. Regardless, plant one at the corner of a home, 10’ away at a minimum to help frame the structure and give definition to the landscape. Once established, they will not disappoint.